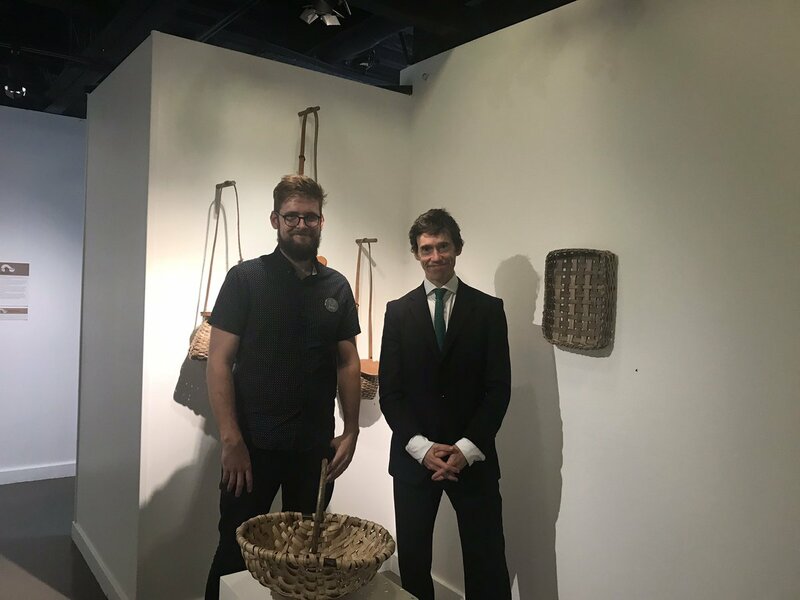 Rory has praised the role of the arts in Cumbria on a visit to the Rheged Centre’s latest exhibition, which is staged in collaboration with the Victoria and Albert Museum. Woman’s Hour Craft Prize, which runs from 14 September – 28 October, showcases the shortlist of the inaugural Woman’s Hour Craft Prize, launched to celebrate the UK’s craft makers and to mark the 70th anniversary of ‘Woman’s Hour’ on BBC4. Featuring products made by the twelve finalists, ranging from bicycles to restored items of clothing, jewellery boxes to woven willow, it offers an insight into the quality of the nation’s arts, design and crafts. Rory was taken around the exhibition by John Stokes, the arts manager at Rheged, who explained the background to the exhibition, and how the Centre had organised it. Mr Stewart expressed his admiration for the Centre’s work, and thanked John and the staff for bringing the exhibition to Cumbria. Mr Stokes also took Rory round a companion exhibition of northern makers, which features woodwork made from South Cumbrian oak by local Lorna Singleton. Inviting Mr Stewart to visit the exhibition, Tristram Hunt, the Director of the V&A, said: “All museums, and especially those embedded in their local communities, are an essential part of the fabric of our society. They transform lives through active public participation, engaging with diverse communities, and sharing collections and knowledge. As a national museum, the V&A supports and engages with museum partners across the UK in many ways including touring exhibitions wherever and whenever possible. It is a vital way of ensuring that our collections and expertise reach diverse audiences across the country”. Commenting on his visit Rory said, “It was a very great privilege to visit the Rheged Centre and see this fantastic exhibition. The arts play a vital role in the life of our communities and our thriving arts scene is an increasing attraction to tourists. The Woman’s Hour Craft Prize, made possible by the generosity of the V&A and the reputation of the Rheged Centre, is wonderful and well worth a visit. I would like to pay a huge tribute to all of those who brought it to Penrith”.